Much like pretty much every other tech company in the world, Apple has been coming under heavy fire as of late because of the fact that it does not do enough to ensure the security of the people that are using its platform every day. A researcher by the name of Linus Henze who works as a white hat hacker revealing flaws in a system for the purposes of security has revealed enormous flaws within Mac OS that could potentially make stealing all of the passwords that you use as easy as pushing a button. Henze was irked that he had not been receiving payments for the work he had done for Apple’s bug bounty program, a program essentially designed to entice programmers into revealing bugs in Apple’s programming so that the company would not have to do so on its own. The flaw that Henze revealed is in the keychain that a Mac uses. This keychain is basically a small storage space in which all of the passwords of a system are stored. 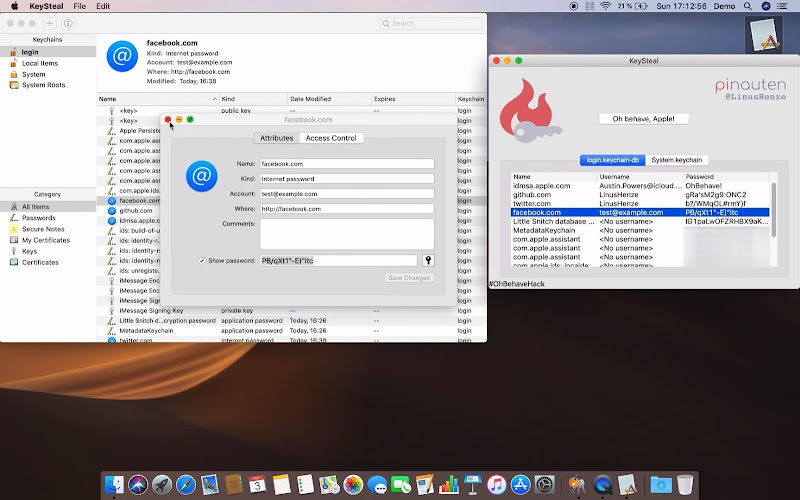 You can use an app on your Mac called Keychain Access to check all of this data out, but Henze has created a different app called KeySteal that can make it very simple indeed to steal data from a different Mac. There is a button on the app that says “Show Me Your Secrets” which you can use to access data from a Mac, and the fact that the process is so utterly simple is what makes it so scary to begin with. Henze’s primary purpose is to show the flaws that he helps expose and reveal how important the job of bug bounty hunters truly is. Apple really does need to take them more seriously.